Denise L. Jenne obtained her doctorate in Criminal Justice from Rutgers University in 1995. She has taught Sociology and Criminal Justice at state and online universities for almost three decades, and she is a published author in the field. Outside of work, she enjoys music, reading, scrapbooking and time with friends. However, one of her greatest joys is being an aunt to her nephew and nieces — including her great-niece Annalise. This is her first work of children’s fiction. 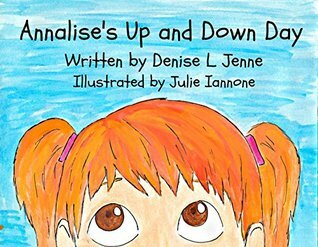 Want to win your very own copy of Annalise’s Up and Down Day? Author Denise Jenne is offering up a free copy of her book to one lucky reader! to visit our giveaway page and enter to WIN! I want to win because I love to read, and I love books.